This sketch dilates the preimage to the image, and asks you to find the center. (And in challenge mode, the scale.) Score up to 100 for placement, with possible bonuses up to 100. 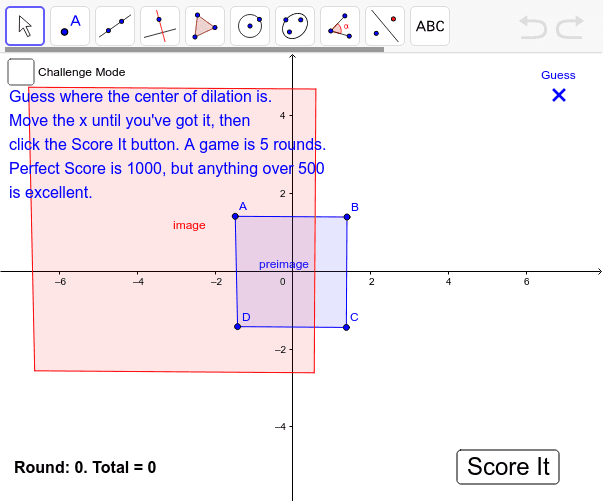 In Challenge Mode, you can score up to another 100 by guessing the scale: but caution - negatives are possible. (Hit enter after entering a scale.) Message or email screenshots of high scores to your teacher!